The issue of a Superintendent Registrar's Certificate. Where a marriage is to take place in the parish church of the parish where one of the parties resides, the banns must be called in that church and in the parish church of the parish where the other party to the marriage resides. If the marriage is to take place in the church of a parish where neither party resides, but in a church which is the "usual place of worship" of one of the parties (i.e. one of the parties is on the church electoral roll of that church), or in a church with which one of the parties can show a qualifying connection under the Church of England Marriage Measure 2008, banns must be called in that church, as well as in each of the parishes where the parties reside. The Church of England Marriage (Amendment) Measure 2012 has made some important changes regarding the time of calling of banns. Banns of marriage may now be called either during the principal Sunday service only or at both the principal service and another service on the same day. If banns are called at two services on the same day, that only counts as one calling of banns. “Principal service” means the service at which, in the minister's opinion, the greatest number of persons who habitually attend public worship are likely to attend. Thus, for example, if more people are likely to attend a sung evensong on a Sunday, rather than a morning Communion service, then the banns should be called at that evensong service only, or else at both services. The Marriages Regulations prescribe the "specified evidence" a couple need to produce to establish that they are both British or EEA nationals when they apply to have their banns published or apply for a common licence. The attached checklist may be of assistance to clergy. A Common Licence is a Bishop's permission for a marriage to take place in a particular church. 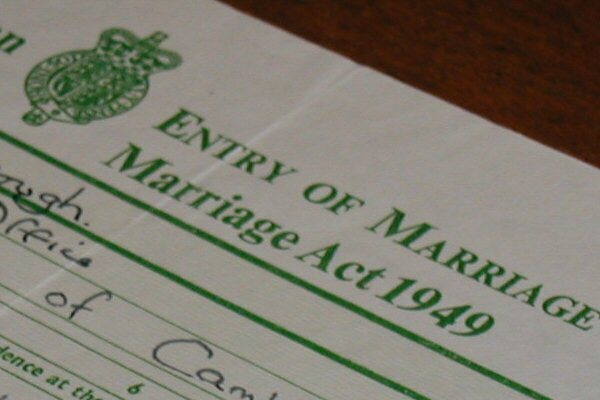 In order to qualify for the issue of a Common Licence, either (a) one of the parties to the proposed marriage must have lived in the parish where the marriage is to take place for at least 15 days immediately preceding the date when the application for the Common Licence is made, or else must be on the church electoral roll (Marriage Act 1949) or (b) one of the parties must be able to show a qualifying connection with the church (Church of England Marriage Measure 2008). An application for a Common Licence may be made by prior appointment at the office of the Diocesan Registrar in Peterborough. However, for those living at some distance from the Diocesan Registry, an application may be made instead to one of a number of clergy around the diocese who have been appointed Surrogates for receiving marriage licence applications. A Common Licence is valid for only three months, and so normally an application for a licence should not be made until within three months of the proposed wedding date. However, where there are special circumstances, such as one party having been previously married (see Marriage After Divorce, below), or where one party is not a British subject, the Registrar may be contacted much earlier, in order that such issues can be considered well before the proposed wedding date. Where one or both of the parties live outside England and Wales (but is an EEA National (see below)) the marriage cannot take place by banns, because the law requires the banns to be called in the place of residence (within England and Wales) of each party as well as in the place where the marriage is to be solemnised. In this case an application for a Common Licence should be made. Please see the Fees page for details of the fees payable for a Common Licence. With effect from 2 March 2016, where one party to a proposed marriage is a non-EEA national, the parties may not be married in church by banns or by Common Licence. They will have to apply to their local Registrar of Births, Deaths and Marriages for a Superintendent Registrar's certificate to allow them to be married in church. See the attached guidance from the Churches' Legislation Advisory Service and the section on the Immigration Act below. The Immigration Act 2014 made important changes to the law relating to the marriage of persons from outside the European Economic Area (EEA). It is essential that all clergy and anyone else involved with the legal aspects of marriage in church (including any lay persons who publish banns) are aware of the new legal position. 1. Where one or both of the parties to an intended marriage is a non-EEA national, the parties will have to obtain a superintendent registrar’s certificate to authorise the marriage (unless an Archbishop’s special licence has been granted). It will cease to be lawful for the marriage of a non-EEA national to be solemnised after the publication of banns of matrimony or on the authority of a Common Licence. See the Home Office Guidance. Anyone else must be treated as a non-EEA national. 3. The change in the law does not affect the issuing of Special Licences by the Faculty Office. The Archbishop of Canterbury's Special Licence will continue to be available to authorise marriages according to the rites of the Church of England, and will continue to be necessary where a couple does not have a legal right to be married in a particular parish church or where the building itself is not licensed for marriages, including school and college chapels, cathedrals, etc. For further information see www.facultyoffice.org.uk. 4. Even where both parties are EEA Nationals and could marry by banns there may be circumstances on which they should obtain advice at the outset. For example, where there are issues over whether a party's previous marriage or divorce abroad is recognised here. It is very much in the interests of the parties to take appropriate advice about these matters well before the marriage. Accordingly it is strongly recommended that even where marriage after banns is legally possible, an Anglican marriage should be by Common Licence in any circumstance where there has been a previous marriage or divorce abroad. It is recommended that the application should be made at the Diocesan Registry rather than to a Surrogate so that the Registrar can consider the position and help the parties. The Home Office have announced that there will be no changes to the rules relating to EEA Nationals (as above) immediately after the UK has left the EU. That means after 29 March 2019 EEA Nationals (as above) may continue to marry after Banns or a Common Licence. The position is expected to remain until early 2020. The longer term position remains unclear but the Home Office will consult before making any changes to the law. The Archbishop of Canterbury has the right to grant a Special Licence for a marriage to take place at any convenient time or place in England or Wales. The issue of a Special Licence is discretionary. The most common need for a Special Licence is if the parties wish to be married in a church or chapel of a parish where neither resides or is on the church electoral roll, and where neither can show a qualifying connection under the Church of England Marriage Measure 2008. Another common reason is if the parties wish to be married elsewhere than in a building which is authorised for marriage according to the rites and ceremonies of the Church of England, for example, a school or college chapel. A Superintendent Registrar of a civil Register Office may issue a Certificate to permit a marriage to take place in an Anglican church. One of the parties must have the required seven days' residence within the registration district and within the parish where the marriage is to take place before applying for the Certificate, or the church must be the usual place of worship of one or both of the parties. The Registrar enters the details of the parties in a book which is open to public inspection and also displays a notice at the Register Office for 15 days. If no impediments are shown within the period of 15 days, a Superintendent Registrar's Certificate can be issued. In practice clergy will recommend banns or a Common Licence (except in the case of a Non-EEA National). Under the Marriage Act 1949, a person may only be married by banns or Common Licence in the church of a parish where he or she resides or is on the church electoral roll. The aim of the Church of England Marriage Measure 2008 is to allow couples to be married by banns or Common Licence, rather than by Special Licence, in a parish where one of the parties can show that he or she has a "qualifying connection". The references to baptism, confirmation and marriage, and to attending public worship, are all confined to services according to the rites of the Church of England. The Measure came into force on 1st October 2008. The House of Bishops has issued some Guidance on the new Measure, which includes a marriage information form, for use by clergy. See also, the Church of England web site. In July 2002, General Synod decided to rescind the marriage resolutions of the Convocations of Canterbury and York, which had urged clergy not to use the marriage service in the case of anyone who had a former partner still living. In November 2002, the House of Bishops issued Advice to Clergy concerning the procedure to be followed when one of the applicants for a marriage licence is a divorced person with a former spouse still living. The Archbishop of Canterbury decided in 2003 to review the policy concerning the issue of Special Licences, and invited the House of Bishops to consider and comment on his proposals. In January 2004, the House of Bishops discussed the issue of both Special and Common Licences in respect of those being married in church after divorce and also where neither party to the marriage has been baptised. The House voted to support the Archbishop's proposals regarding the issue of Special Licences and agreed that the same policy should apply to the issue of Common Licences by Diocesan Bishops. The General Synod Office has produced for enquiring couples a Form and Explanatory Statement concerning marriage in church after divorce. In future, when a couple wish to apply for a Common Licence, if one of them is a divorced person with a former spouse still living, the clergyman concerned should interview the couple, in accordance with the Advice to Clergy, and ask the couple to complete the Form and Explanatory Statement. The completed form should be submitted with the application for a Common Licence to the Diocesan Registrar, who will seek the advice of the Bishop. It was formerly the practice that, where neither party was baptised, an application for a common licence should be referred to the Bishop. At a meeting in January 2004, the House of Bishops agreed that the unbaptised status of one or both parties should no longer be a bar to the grant of a Common Licence. Accordingly there is no longer a need to refer an application to the Bishop where neither party is baptised. Q1: Can I be married in any church in the benefice where I live? Q2: Is a clergyman or woman obliged to marry a parishioner? Yes, unless either (a) one of the parties is divorced and the former spouse is still living, or (b) the marriage is prohibited by law owing to the relationship of the parties, or (c) one of the parties is a minor and the appropriate consent or consents have not been given. Q3: Where can I be married if my parish has no parish church? (1) You can be married in any church of a parish with which you have a qualifying connection under the Church of England Marriage Measure 2008 (see above). (2) You can apply for a Special Licence to be married in a church or chapel or other place where you do not have a connection under the 2008 Measure, although in practice the Faculty Office will not normally issue a Special Licence unless you have some connection with the place where you wish to be married, for example, a school or college chapel. (3) Under the Marriage Act, if a person lives in a parish which has no parish church (where, for example, there is a Parish Centre of Worship, which does not have the legal status of a parish church) or is on the electoral roll of a church which is not a "parish church", he or she has the right to be married in the parish church of any adjoining parish. When the Church of England Marriage Measure 2008 came into force and created "qualifying connections", a person having a connection with a parish with no parish church did not have a similar right to be married in the parish church of any adjoining parish. This is because the 2008 Measure only gave the person the right to be married in a church of a parish where he or she had a qualifying connection (e.g. where he or she used to live). This situation could give rise to a difficulty, because if a person lived in a parish with no parish church (Parish A), and booked a wedding in the church of an adjoining parish (Parish B), but then moved before the wedding to Parish C, the person could not have banns called in Parish B, because the qualifying connection was with Parish A, not Parish B. This difficulty has now been addressed by the 2012 Measure. If a person has a qualifying connection with a parish with no parish church, they can now have banns called and be married in the parish church of any parish adjoining the parish where they have a qualifying connection. Q4: What happens if the church in which I am to be married has to be closed for repairs or rebuilding? Where a person is entitled under the Marriage Act to be married in a particular church (i.e. resident in the parish or on the church electoral roll), but that church has to be closed for repair or rebuilding, the parish can be treated as part of any adjoining parish. Therefore the person can have banns called and the marriage can be solemnised in the parish church of any adjoining parish. "Adjoining parish" means any parish physically adjoining the first parish. This could include a parish in a different benefice. It would not include another parish in the same benefice which is not contiguous with the first.) The Church of England Marriage (Amendment) Measure 2012 now provides that a similar arrangement will apply to a parish where a person has a qualifying connection. Thus, if a couple are planning to be married in a parish where they have a qualifying connection, but the church has to be closed temporarily at the time of the wedding, the couple will be treated as having a qualifying connection with any adjoining parish. Q5: Is it possible to be married in my school or college chapel? Yes, if the Faculty Office is prepared to grant a Special Licence. Q6: Can I be married in the church of the parish where my parents live? The Church of England Marriage Measure 2008 allows a couple to be married by banns or by common licence in the church of a parish where a parent of a party to the proposed marriage has resided at any time for a period of not less than six months during the lifetime of the party concerned. Q7: Can I be married at any time of day? Special Licence can authorise a marriage at any time of day or night, but in the case of the other alternative preliminaries, the marriage must take place between 8.00am and 6.00pm. See the Opinion of the Legal Advisory Commission concerning the timing of marriage services. Q8: What is the cost of a Special Licence? The fee payable for a Special Licence (issued by the Faculty Office in Westminster on behalf of the Archbishop of Canterbury) is £315.00 (as from 1 April 2013). Once the application has been approved, one of the parties will have to swear an affidavit (a formal statement) to confirm the information given. This can be done in front of an Anglican minister (to whom a fee of £5.00 will be payable) near to where the parties to the proposed marriage reside, or at the Faculty Office (when no extra fee is charged). Q9: Can I have a Roman Catholic (or other non-Anglican) wedding in an Anglican church? No. A Roman Catholic wedding in England must be preceded by civil preliminaries, and must take place in a registered building. An Anglican church is a not a "registered building" for this purpose. Q10: Can a Roman Catholic (or other non-Anglican) be married in an Anglican church, even if it is not possible to have a Roman Catholic (or other) wedding service? Yes. People of any faith can be married in an Anglican church, provided that the Anglican form of marriage service is used. An Anglican priest must conduct the service. For the marriage to be legally valid, there are certain parts of the Anglican marriage service which an Anglican priest must say, including the final blessing, but a clergyman of another denomination may assist with other parts of the service, for example, an address or prayers. There is a detailed discussion of this question in Legal Opinions Concerning the Church of England, 8th Ed. 2007 on pages 365-366. Q11: What is the correct terminology for describing the parties to a marriage in marriage certificates? The same terms will be used in applications for Common Licences. Q12: What is the correct wording for the calling of banns? "I publish the banns of marriage between N of ------- and N of ------. If any of you know cause or just impediment, why these two person should not be joined together in Holy Matrimony, ye are to declare it. This is for the first [second or third] time of asking." This is the first/second/third time of asking. If any of you know any reason in law why they may not marry each other you are to declare it." Q13: What wording should be used by a clergyman calling banns in a case where one of the parties to a proposed marriage has a qualifying connection under the Church of England Marriage Measure 2008? The normal wording referred to in the prevous answer should be used for the banns, except that at the point where the banns refer to the person with the qualifying connection, the words "N of the parish of ------" should be changed to "N of the parish of ------ who wishes to be married in this church by virtue of his/her connection with this parish". Q14: One of the parties to a proposed marriage is divorced. Is it necessary to mention the status of the parties when banns are published? No. It is not necessary to mention the status when calling banns. Q15: Does my natural father's name have to appear in the marriage register? Normally, the natural father's name should appear in the register. Where a person has been legally adopted, his or her adoptive father's name may be entered without qualification. But if the party to the marriage is known by a surname different from that of his or her adoptive father, and the name and surname of the adoptive father are entered in column 7 of the register, then the words "adoptive parent" may be entered in brackets after the surname, if this is desired by the party. But occasionally one of the parties to a marriage may not wish his or her father's name to appear, for example, if he or she has never known his or her natural father, or has been brought up by a step-father. In such case the minister should not insist on the natural parent's name being entered, but should draw a line through the columns relating to the father's names and profession, to show that the information was not supplied. However, since the coming into force of the Registration of Marriages (Amendment) Regulations 2007, it has been permissible to record a step-father's name, instead of the natural father's name, provided that the step-father is, or has been, married to the mother. Where a step-father's name is entered, the word "step-father" should be entered after the surname. Q16: What should be done if a clergyman makes an error in a marriage register? See the Guide for Clergy, published by the General Register Office. The Faculty Office booklet Anglican Marriage in England and Wales : A Guide to the Law for Clergy, priced £7.50, can be ordered online directly from teh Faculty Office. The General Register Office has produced an excellent Guide for Clergy in relation to the Marriage and Registration Acts.